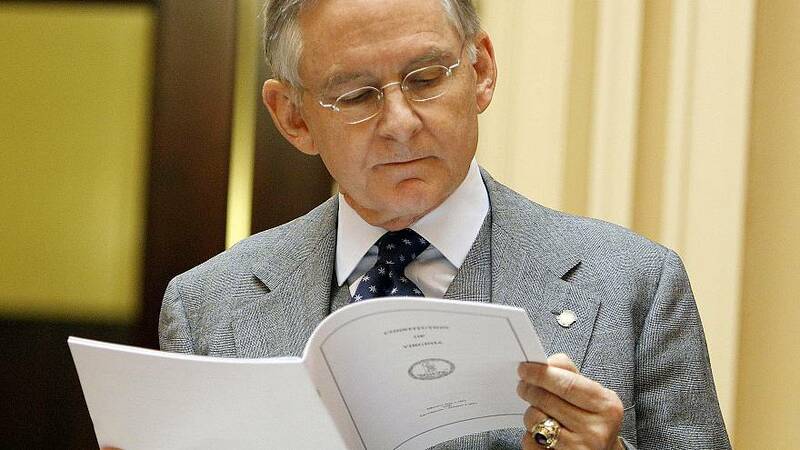 Another Virginia politician — state Sen. Tommy Norment, the Republican majority leader — was swept up in the state's growing blackface scandal on Thursday after it was revealed that he was one of the editors of a 1968 Virginia Military Institute yearbook that featured racist language and students in blackface. Norment, who does not appear in any of the yearbook photos of students wearing blackface, initially refused to comment when approached by NBC News on Thursday. He later said in a statement through his spokesperson, "The use of blackface is abhorrent in our society and I emphatically condemn it. As one of seven working on a 359-page yearbook, I cannot endorse or associate myself with every photo, entry, or word on each page. However, I am not in any of the photos referenced on pages 82 or 122, nor did I take any of the photos in question." There are multiple photos of students wearing blackface in the yearbook, which also contained the N-word. A student from Thailand was referred to in the yearbook as a "Chink" and "Jap," while a caption under another student's picture referred to him as the "Barracks Jew," the Daily Press reported. The school was first integrated in 1968. "As my comment on Page 236 notes, I supported the integration of VMI," Norment said in his statement. "And in 1997, I led the effort to have my alma mater include women for the first time." Norment added that he is "not surprised that those wanting to engulf Republican leaders in the current situations involving the Governor, Lt. Governor, and Attorney General would highlight the yearbook from my graduation a half century ago." The latest revelation follows a string of controversies that have engulfed the top three elected officials in the state, all Democrats. Last week, it was revealed that on Gov. Ralph Northam's page in a 1984 medical school yearbook shows photo of a person wearing blackface and another wearing Ku Klux Klan robes. Northam at first apologized for the photo, but then said a day later that he was not in it and didn't know why it was on his page. He also admitted that he once wore blackface as part of a Michael Jackson costume he wore at a dance contest in 1984, the same year the yearbook was published. Northam is facing increasing calls from prominent Democrats to resign, but so far he has refused. On Sunday, a California woman accused Lt. Gov. Justin Fairfax — who is first in line to succeed Northam should he resign — of a sexual assault that took place 15 years ago at the 2004 Democratic National Convention in Boston. Fairfax has emphatically denied the allegation of Scripps College professor Vanessa Tyson and said their encounter was consensual. Tyson has retained the legal team that represented Christine Blasey Ford, who accused Supreme Court Justice Brett Kavanaugh during his confirmation process of sexual misconduct that she said took place when they were in high school. Fairfax, meanwhile, has retained Kavanaugh's legal team. On Wednesday, state Attorney General Mark Herring — the second in line to succeed Northam — admitted to once wearing blackface when he was 19 years old. He profusely apologized in a lengthy statement.